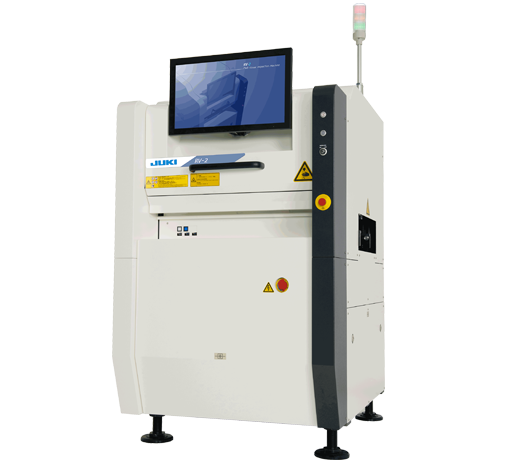 JUKI’s RV-2 is an accurate high-speed inline SPI machine that is equipped with an innovative i3D LED measuring head using the principle of photometric stereo technique. On top of that, it is possible to operate several RV-2 units from one workspace using Total Operation System Software – TOPSS. Thanks to the possibility of a rapid program creation, it only takes about five minutes to create a program. Working with standard measurement algorithms is possible. In case complex measurement tasks are necessary the corresponding algorithms can also be customised, therefore avoiding pseudo errors. RV-2 SPI forgoes delicate and expensive projector technology. Instead it uses the principle of photometric stereo technique. With quick sequential light exposure from different angles and image capturing, the printed circuit board is measured three-dimensionally. If required, the durable illumination unit can be replaced at a reasonable price.